It’s expensive to fly to low-Earth orbit, let alone Mars and beyond. Engines are still propelled primarily by burning liquid fuel, but future missions by NASA could utilize alternative sources of space propulsion, such as solar-electric propulsion driven by high-power solar arrays. 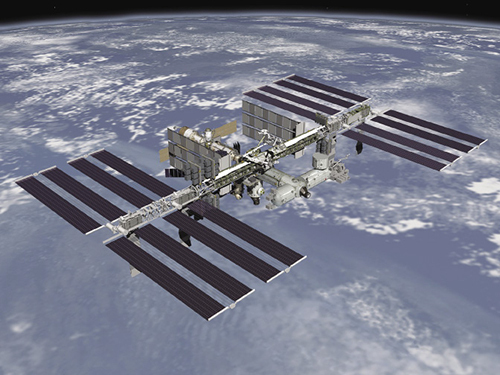 Some vehicles and satellites, as well as the International Space Station, already are equipped with large solar arrays, which come with hefty price tags due to the high cost associated with space-qualified solar cells. NASA currently works with two primary manufacturers of solar cells, and the market could soon be expanding to include new players with modified production techniques as the demand increases. Solar arrays like these, attached to the ISS, will be increasingly important to NASA as the Agency works to travel deeper into space. Most space solar cells have a conversion efficiency of about 30 percent, meaning that amount of incident sunlight is absorbed by the cell and turned into electrical energy. The greater the efficiency, the smaller the solar cell area needed for a particular job or mission. The price for these cells has remained steady for quite some time, Piszczor says, and with the traditional space focus on efficiency and high reliability, there’s little incentive for the technology or the cost to change. However, one company is experimenting with a new method of growing cells using a reusable substrate that could shake up the industry. MicroLink Devices Inc., based in Niles, Illinois, has been awarded multiple SBIR contracts from NASA to focus on cost reduction and improved cell performance. Most have gone toward developing a new method for growing inverted metamorphic multi-junction (IMM) solar cells using a substrate of gallium arsenide, and a process for reusing the substrate that could ultimately result in less expensive but more flexible and lightweight photovoltaic cells. The cells might be slightly less efficient now than the majority of IMM solar cells on the market, but it’s an enticing concept, Piszczor says. “What’s nice about IMM is it’s very thin, so you save on mass and the supporting array structure, and it’s flexible as well,” he says. As NASA looks at the possibility of putting larger solar arrays in space, building on current solar array sizes of 10 to 15 kilowatts in the hopes of producing arrays with hundreds of kilowatts, the current method of manufacturing space solar cells may be cost prohibitive. A lightweight, flexible, space-qualified solar cell with a substantially reduced price would make it more likely for NASA to achieve the goal of developing solar arrays capable of producing up to several hundred kilowatts, the kind of power needed for some solar-electric propulsion missions, he says. MicroLink’s cells are similar to the current space-rated options used by NASA in that the cells are triple-junction, meaning the sunlight is split into three ranges of wavelengths that are captured by each corresponding material layer to improve the overall conversion efficiency of the device. Troops in desert regions already are using MicroLink Devices’ flexible, lightweight solar arrays as a source of portable, renewable energy. 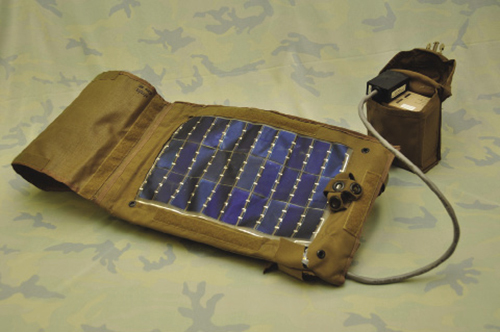 The panels attach to a backpack and are capable of charging military batteries, eliminating the need to carry extra ones. The cells may not have the same efficiency as other cells, but that might not matter in the long run. MicroLink originally was developing these flexible cells for other Governmental departments. “We started this work in 2007 with some funding from the Department of Energy” from another SBIR contract, Youtsey says. In addition to off-Earth applications, the cells can be used in concentrator systems, “where optics focus the light down on a very small cell, increasing the focus of light by maybe 500 or more times” than if the cells were placed individually. 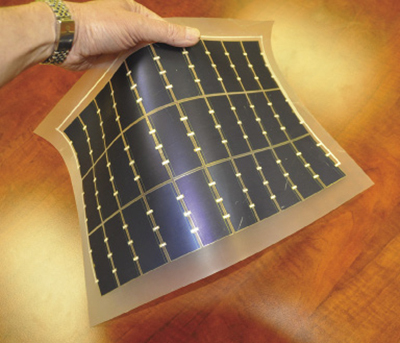 Thanks to an innovative process that incorporates a reusable substrate, MicroLink Devices has created thin, flexible solar cells and arrays that could be used to help power exploration in space. Already the military is benefiting from MicroLink’s work. Rao Tatavarti, MicroLink’s technology director, points to a solar array troops carry when out on patrol, which collects sunlight and is used to recharge batteries. This frees up space and weight for other mission-critical items, such as ammunition or food, instead of extra batteries. In 2014, the magazines Popular Science and Popular Mechanics both featured articles about these panels, with Popular Mechanics lauding the U.S. Naval Research Laboratory’s Marine Austere Patrolling System developed by MicroLink as its 2014 Breakthrough Award for Innovation. A similar panel made in partnership with the Naval Research Laboratory and the Marine Corps Expeditionary Energy Office was featured in a March 2014 issue of Information Week. Additionally, Youtsey says MicroLink has been working on incorporating panels into unmanned aerial vehicles.